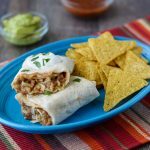 Make these Bean and Cheese Burritos ahead of time and pop them into the freezer for a quick and easy lunch! I’ve always loved bean burritos. I can remember when Taco Bell came to our small town growing up, and it was a pretty exciting thing for us. Gotta love small towns! Ha! Money was pretty tight at that point, so we didn’t eat out often. But, because their tacos were like 39 cents or something, we could occasionally go after church on Sunday night. Their bean burritos and tostadas were also pretty cheap, so my go-to became a bean and cheese burrito and tostada. Another cheap favorite of mine was the Patio brand of bean burritos. Man, I loved those, too. Unfortunately, those favorites are cheap for a reason. They are full of bad ingredients. So, I decided to start making my own bean and cheese burritos at home. Then, I just place them in the freezer for quick and easy lunches or on nights where I’m too tired to cook. I get to control the quality of ingredients, so they are much healthier than my old bean and cheese burritos. No hundred mile long ingredient list of who knows what here! I do take advantage of some store-bought refried beans, but they have a pretty clean ingredient list. I get the Whole Foods 365 brand of fat-free refried beans. They are still pretty cheap to make, so they are great for healthy budget-friendly meals. I use the Margarita’s Tortilla Factory brand of tortillas that I get at Whole Foods to make mine. They have a pretty clean ingredient list. You’ll want the burrito size tortillas to make these, and this recipe calls for nine of them. For the diced green chiles, you can either use the canned ones or make your own roasted green chiles. If using canned, I’d go with the mild variety. 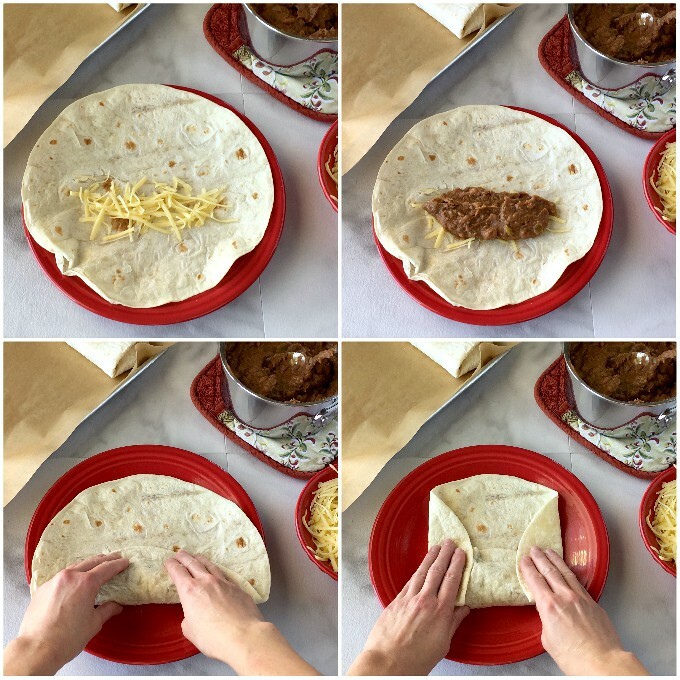 How do you make bean burritos? I know there are a couple of ways to fold burritos, but this is my preferred method. Just place a couple of tablespoons of cheese onto your tortilla. Then spread half a cup of beans on top. Next, fold the bottom half of the tortilla over the beans and pull back slightly. Fold in the sides and roll the bottom half (the end nearest you) up the rest of the way. How do you freeze bean burritos? You’ll want to have a parchment paper-lined baking sheet ready to go before you start. Then, just place each burrito on the baking sheet as you go. Place the baking sheet into the freezer and let them freeze until solid. Then, pop them into freezer bags. You get nine servings out of this easy burrito recipe. Not bad for the little bit of time that these take to make. Serve them with sour cream, salsa or guacamole for a tasty hearty meal! 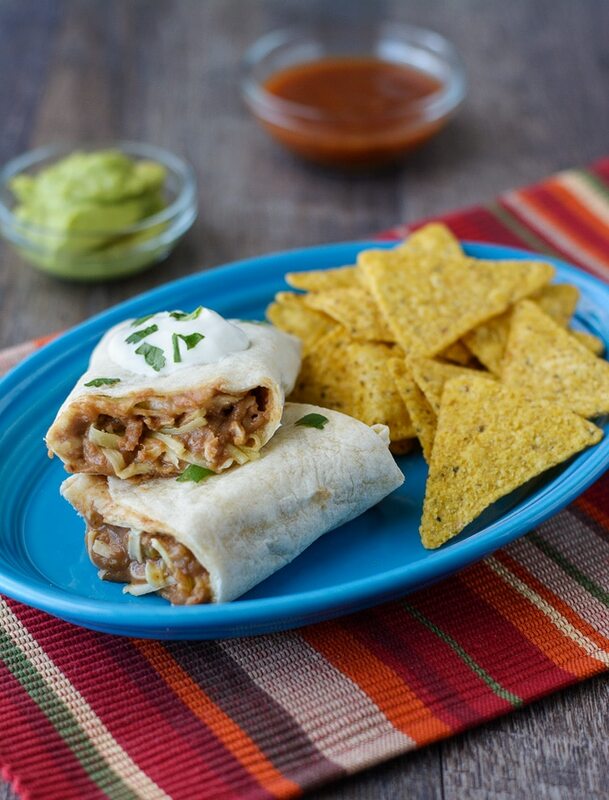 Make these Bean and Cheese Burritos ahead of time, pop them into the freezer and reheat as needed for an easy lunch! In a 2-quart saucepan, mix the beans, green chiles, and spices together. Heat them over low heat until warmed through and they become more spreadable. Set up an assembly line of beans, cheese, and tortillas. Heat a large skillet over medium heat and heat each tortilla for about 20-25 seconds, flipping half-way through. This is to help make the tortillas more pliable and less apt to break when folding. Place 2 tbsp of cheese onto each tortilla, top with about 1/2 cup of bean mixture. Be sure to leave plenty of room on each end so you can fold it. Fold the bottom half of the tortilla over the filling and pull back gently, then fold then ends in. Roll the bottom half (the end nearest you) up the rest of the way. Place onto parchment paper-lined cookie sheet and continue the process until all the burritos are made. Place sheet pan into the freezer and let freeze until the burritos are solid and firm. Then, place into freezer bags and put back into the freezer. 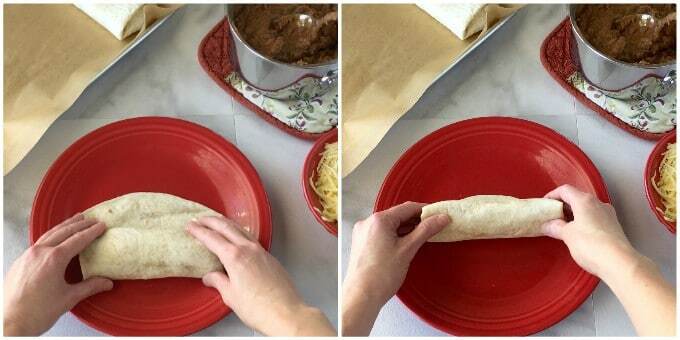 To reheat (for 1 burrito), wrap a damp paper cloth around the burrito and place into the microwave for 2 to 2 1/2 minutes, turning halfway through, or until filling is hot. Reheating in my 1000 watt microwave takes about 2 minutes. Be sure to turn halfway through. Cook times will vary depending on your microwave. I'd start with a minute and go from there.